Breakfast cereals are a popular and nutritious way to start the day but shop-bought brands can get expensive and boring - they can also contain far more salt and sugar than is really good for you. Making your own can be cheaper, more fun and allow more variety. Best of all you can make your cereal exactly as you want it. 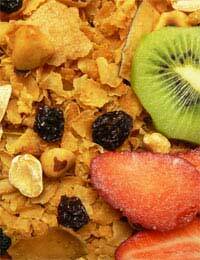 Buying ingredients for your own breakfast cereal also means you can customise it and eat a varied breakfast every day. You can eat these cereals with milk, yoghurt or juice and may also want to add fresh fruit to serve. Put all the ingredients in a plastic bag and shake well or alternatively stir through in a large bowl. Add the ingredients to a pan and heat, stirring until it boils. Spread the mixture on a baking tray and bake in an oven at 300 degrees farenheit for an hour or until golden and toasted. Shake occasionally. When cooled this mixture can be stored in an airtight container. There should be enough portions for one for a week. If you want to vary this muesli, you could change the base to wheatgerm, bulgur wheat or plain puffed wheat (check for any cooking/preparation instructions). You could easily vary the type of nuts that you add or even stir through peanut butter once you’ve added your milk. Vary the fruits to ring the changes – consider raisins, cranberries, pineapple or currants. Don’t forget fruits such as dried banana, apples and mango. If you want to sweeten the cereal a little more, add brown sugar, honey or maple syrup (a couple of tablespoons is enough for the recipe above). If you’re feeling naughty you could throw in a few marshmallows or chocolate chips. Add spices such as ginger, cinnamon and cloves for a warm, autumnal flavour. If you don’t want a cereal based on grains, you can make your own grain-free version. Combine and mix the ingredients in a large bowl. Spread the mixture on a baking tray and bake in an oven at 300 degrees farenheit for an hour or until golden and toasted. Stir/shake the mixture thoroughly mid-way through for even cooking. This recipe could also be varied by changing the nuts, seeds and flavourings that you add. Experiment! If you’re on a budget try shopping for cereal ingredients in bulk or at food weigh-houses as these types of foods are often available much cheaper this way than in supermarkets.